Pimento Cheese is a Southern staple from way back. When I was a child, we made sandwiches with it, and if we were getting fancy, we might grill the sandwich in a pan with butter. My mouth waters like one of Pavlov’s dogs at the thought of a grilled pimento cheese sandwich with tomato soup. Occasionally, my mother would stuff celery sticks with pimento cheese. Nowadays, restaurants specializing in Nouveau Southern Cuisine are using pimento cheese as an ingredient in everything from Fried Green Tomato Napoleons to a topping for french fries. Liz Talbot, my Southern private investigator, loves pimento cheese as much as I do. And while she’s never tasted a variation she didn’t like, she loves her mamma’s best. In Lowcountry Bombshell, Carolyn Talbot makes a batch of pimento cheese, and she always makes enough to share. Liz gets a bowl for herself, which she rations, because while it is tasty, Mamma’s pimento cheese is no one’s idea of health food. I invented this recipe myself because my sister-in-law, who makes truly remarkable pimento cheese, cooks like I do—a little of this, a little of that. When she shared her recipe, it was verbally, over a glass of wine at the family Christmas party. I couldn’t remember it of course. But I had fun making up my own. The recipe I use makes roughly three quarts—plenty to share. My family would have a fit if I made a small batch. But since not everyone may need the volume our clan demands, I’ve reduced it to a size appropriate for folks who aren’t addicted to the stuff. I hope you enjoy it as much as Liz and I do! Drain pimentos in a very fine strainer. Place the cream cheese in the bowl of an electric mixer, and beat until fluffy. Add the mayonnaise and blend. Add the sour cream and blend. Add the onion with juice and blend. Add salt, peppers, Worcestershire sauce and garlic powder and blend thoroughly. Shred the hoop and Cheddar cheeses and mix together in a very large bowl. Pour cheese mixture over the shredded cheeses and stir gently until all the cheese is moist and the spread has a uniform appearance. Stir in strained pimentos and chives. Cover and refrigerate for at least 4 hours (see note). Use it as a spread on crackers, pita bread, celery—practically anything. And don’t forget to grill yourself a sandwich and have it with tomato soup. 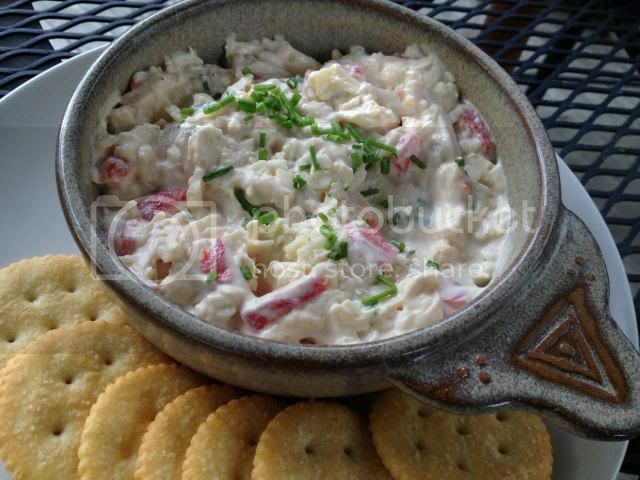 -It’s best to let pimento cheese refrigerate for at least four hours. Overnight the consistency will firm considerably. It will keep in your refrigerator for weeks, but never lasts that long in ours. I give it out in small Ziploc containers to family and friends.